"My God! This dental office is exceptional!! The entire staff is genuinely so friendly and welcoming! They are extremely informative and keep their patients best interest at heart! Continuously making sure you are comfortable and at ease! If I could give them 100 stars, I'd give them 200!" "This is the most professional, clean and kind dental group that I've ever visited." "Love the experience, service was excellent!" "I recently had a cavity filled here and the service was great. The doctor and assistant were professional and courteous. The work was completed quickly and without pain, no complaints." "The surgeon did a great job with the extraction and has good chair side manner. The team supported the whole process well. Very happy." "Very professional and friendly! I would highly recommend this office." "Always a great experience with Dr. Timpner and staff"
"As always. I am not a fan of coming to the dentist but every 6 months when I do, it is stress free." "The doctor and staff were great as always is the case." "Always top notch service from the time you check in to the time you check out,"
"Always first rate experience. Highly recommend to all. Thank you!!" "This office is so efficient. I can count on my appointment starting on time every time. The staff are kind and skilled at what they do. Linda is my hygienist and she’s great. The dentists are thorough and personable." "Dental office always wounderful evertime I visit . everyone is really nice and understanding when it comes to the care of your teeth"
"Excellent visit as usual. Nancy is the best hygienist! Dr. Greenbaum was his usual kind and considerate self. All is good in my teeth world. Thank you!" "Dr. Al-Hadidi and hygienist Nancy make it worth my 45-mile drive." "Very friendly professional staff! Love Dr. Hadidi!" "Super good. Loved Jody, autumn and of course dr. Phil! Had a cap torned off and prepped for a new one. An hour later i was playing softball!! Np. Jim"
"I always feel clean & fresh when I leave the offices of Dr Greenbaum, MacFarland & Timper, love my dentist!!" "I always get treated very well at this dentist office. They are so helpful with all my conditions. They even gave me an umbrella when it was raining! Answers all my questions and concerns. Just very professional and caring. They are a wonderful team of people!" We are proud to be privately owned and operated for 30+ years! 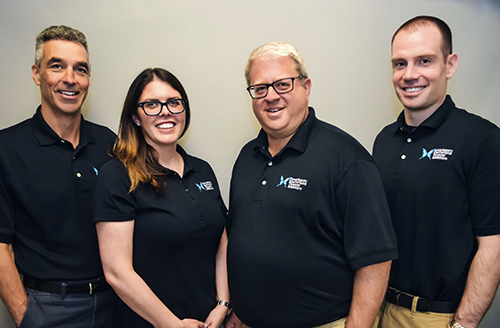 We believe that we have become the most popular dental office in the Plymouth-Canton area by providing you with the highest standards of professional care as well as comfortable, quality dentistry for every member of your entire family. While we are now a large office, we started from scratch in Canton in 1980. We have grown and continue to grow by sticking to what made us successful in the first place: honesty, personal attention, pain-free care, and reasonable fees at each and every visit. Our size works in your favor. You can choose to see the same dentist and hygienist every visit, but just in case you have an emergency on a Saturday, we'll be there. We're open 6 days a week with early morning appointments. You'll see the same friendly faces year after year. Most of our staff has worked with us for more than 10 years. Many for over 20. This stability is rare these days and it speaks to the deep commitment our staff shares in providing sensible, quality dental care to each and every one of our patients. We invite you to spend a few minutes exploring our web site so you can see why so many of your neighbors have decided to make our office the dental office of choice for their family. Dr.Greenbaum graduated from the University of Michigan School of Dentistry in 1989. He has advanced training in the field of implant dentistry and cosmetic dentistry. He has successfully worked with hundreds of denture and partial denture patients to improve their chewing and comfort. Dr. Watkins is originally from Bloomington, IN but is now happy to call Canton, MI home. He received his bachelor of science from the University of Michigan and his degree of dental surgery from Indiana University.Dr. Watkins enjoys offering all aspects of dentistry, including implant placement and cosmetic cases. Dr. Watkins belongs to a family of dentists. His wife, Maggie,practices in Saline, MI. His father and brother practice in Indiana. In his free time, Dr. Watkins enjoys spending time with his young children, Cole and Leah, playing basketball, golfing, and watching sports.